In processes where corrosion and erosion are constantly present problems metal materials are often exchanged for composite materials. The main advantage with a chemically resistant laminate is its good corrosion qualities, durability and long lifetime. With more durable products with long lifetime the industries and factories can concentrate on the process and avoid time consuming and advanced maintenances. Our composite reactors can be found all over the world in mines, metal processing industries and other types of metallurgical industries. Biogas production is a modern and growing industry. 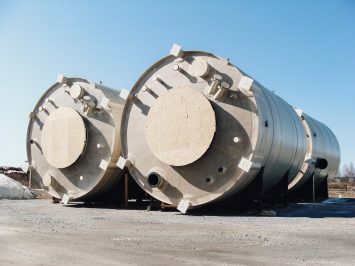 Reactors, durable against the erosion that occurs during the digestion process, are a key unit in production of biogas. We delivered our first biogas reactor to ED Biogas in Sweden 2015.